The Fuzzy Overlay tool allows the analysis of the possibility of a phenomenon belonging to multiple sets in a multicriteria overlay analysis. Not only does Fuzzy Overlay determine what sets the phenomenon is possibly a member of, it also analyzes the relationships between the membership of the multiple sets. The Overlay type lists the methods available to combine the data based on set theory analysis. Each method allows the exploration of the membership of each cell belonging to various input criteria. The available methods are fuzzy And, fuzzy Or, fuzzy Product, fuzzy Sum, and fuzzy Gamma. Each approach provides a different aspect of each cell's membership to the multiple input criteria. The fuzzy And overlay type will return the minimum value of the sets the cell location belongs to. This technique is useful when you want to identify the least common denominator for the membership of all the input criteria. For example, in a housing suitability model, you may only want to select locations that have at least a 0.5 or greater possibility of being suitable for all the criteria. The fuzzy Or overlay type will return the maximum value of the sets the cell location belongs to. This technique is useful when you want to identify the highest membership values for any of the input criteria. For example, in a housing suitability model, you may want to identify all locations that have at least one of the criteria being fully in the suitable set, a value of 1. The fuzzy Product overlay type will, for each cell, multiply each of the fuzzy values for all the input criteria. The resulting product will be less than any of the input, and when a member of many sets is input, the value can be very small. It is difficult to correlate the product of all the input criteria to the relative relationship of the values. The fuzzy Product option is not used often. The fuzzy Sum overlay type will add the fuzzy values of each set the cell location belongs to. The resulting sum is an increasing linear combination function that is based on the number of criteria entered into the analysis. Fuzzy Sum is not an algebraic sum and should not be confused with the additive approach used in the Weighted Overlay and Weighted Sum tools. These two overlay approaches assume that the more favorable input, the better. To add all the membership values in a fuzzy Sum analysis does not necessarily mean the location is more suitable. The fuzzy Sum option is not used often. Fuzzy Gamma establishes the relationships between the multiple input criteria and does not simply return the value of a single membership set as does fuzzy Or and fuzzy And. 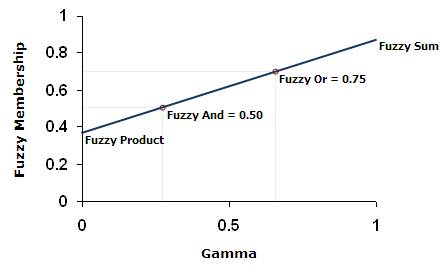 You can use fuzzy Gamma when you want values greater than fuzzy Product but less than fuzzy Sum.